Here is the 2016 Winnipeg Jets (Original) Qualifying Tournament in its entirety. The 7th-seeded ’92-’93 Winnipeg Jets had the ’84-’85 Winnipeg Jets on the brink of elimination, but the two-time reigning representatives pulled through in the face of adversity. The series started out well for the ’84-’85 Jets with a 10-6 win in Game 1. Dale Hawerchuk scored a hat trick and added an assist for four points. Defenseman Tim Watters also pitched a four-point night with a goal and three assists in the win. The ’92-’93 Jets won the next three games and won the first one courtesy of an overtime winner from defenseman Phil Housley. The Finnish Flash, Teemu Selanne obviously, helped set up that game-winning goal for his third point of the night. 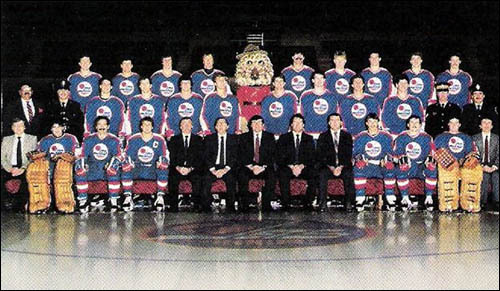 The ’92-’93 Jets then took Game 3 by a score of 8-5 with three goals from Thomas Steen and two from Keith Tkachuk. Winger Evgeny Davydov and defenseman Fredrik Olausson combined for seven assists. Selanne then scored four goals in Game 4 as the ’92-’93 Jets won 8-6 and Housley totaled four points with two goals and two assists. The ’84-’85 Jets got back on track with a 7-5 win in Game 5 after scoring six goals in the first period. Hawerchuk netted a hat trick and added an assist while five others registered multi-point games for the ’84-’85 Jets. Game 6 was an absolute beatdown. The ’84-’85 Jets outshot the ’92-’93 Jets 67-41, but beat them on the scoreboard 13-2. Hawerchuk totaled seven points (4G, 3A). Paul MacLean totaled five points (2G, 3A). Four others finished the game with at least three points. Then came Game 7 where the ’84-’85 Jets completed the hat trick with a 7-5 win. Steen, the only player on both teams, scored four times and added an assist for a five-point night. Hawerchuk and defenseman Robert Picard pitched in with three-point nights. Up next is the 2016 Nashville Predators Qualifying Tournament! This entry was posted in Qualifying Tournament, Ultimate NHL Playoff and tagged Bob Essensa, Dale Hawerchuk, Darrin Shannon, Evgeny Davydov, Fredrik Olausson, Jim Hrivnak, Keith Tkachuk, Laurie Boschman, Paul MacLean, Phil Housley, Qualifying Tournament, Randy Carlyle, Robert Picard, Teemu Selanne, Thomas Steen, Tim Watters, Ultimate NHL Playoff, Winnipeg Jets. Bookmark the permalink.